The crowd was sparse in section 226 at Wrigley Field that Saturday afternoon, even after the game had started. The row in front of me was completely empty, and the eight seats between me and the aisle were vacant–except for one. He was an older man. He had obviously dedicated his life to eating right and exercising regularly. Though his biceps and face sagged, revealing some age, he was in impeccable shape. He reminded me of my grandfather’s friend, the one who always took delight in asking people to guess how old they thought he was. When they’d guess 65, he’d squeal with delight and clap his hands exclaiming, “I’m 78! I sure fooled you!” This old man sat alone, but conversed politely with the young couple behind him. He limited their interactions to the moments between innings, so as not to distract from the game, each saying just enough to temper the loneliness of section 226. He sat cross-legged and sideways in his seat, enjoying the space that being alone affords, a scorebook on his lap. He kept a pen tucked next to his ear, the tip resting just under the bill of his felt Cubs hat. He would score a play and in one fluid motion tuck the pen back over his ear—something he’d no doubt mastered only after years of practice. Our seats were too far removed for conversation, but in the second inning, he noticed me sitting in a similar posture to his own. I too was alone, scorebook perched on my lap. He nodded in approval, I responded in kind. 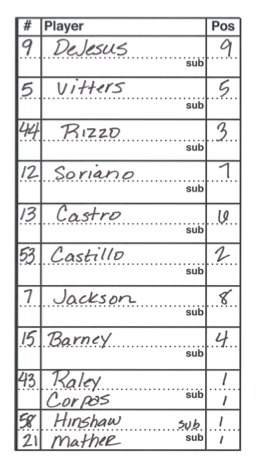 We returned to our respective pads, each writing, in the scorekeeper’s secret code, “BB” to denote a Wellington Castillo walk. While I can thank my father for teaching me to scoop balls from the dirt without turning my head and for knowing how to properly block home plate, my earliest sports memories involve my mother, who worked tirelessly as a Little League booster. When I was very young she coached our teams, but when she was diagnosed with Multiple Sclerosis, she traded her fungo bat for a pen (always pen) and a scorebook. If there was a game, she would sit behind the backstop and keep score—every detail, including balls/strikes, recorded permanently. On the drive home, I’d hold her book and ask her what the hieroglyphics meant. Soon “1B” “K” and “6-4-3” became part of my everyday vernacular. “He thinks I’m 15,” I thought. “If it’s not a burden,” he said hesitantly, “would you mind keeping score for me while I run to the warsh-room?” Warsh. Just like my grandfather. I’ve been asked to do this often enough that I have perfected the art of keeping two books at once. To be asked to mind a scorebook is a hard-earned honor in my circle of baseball friends, most of whom treat an afternoon at the ballpark as a scholarly endeavor, not a keg party (though sometimes we sneak a flask of bourbon). It wasn’t until a game early this season, in which I broke down Bryce Harper’s hitting mechanics with words, gestures, and diagrams, pondering this important matter with my companion (also a baseball writer), that I realized how different we were from other attendees. With such company comes the responsibility of keeping score honor in my circle of baseball friends, most of whom treat an afternoon at the ballpark as a scholarly endeavor, not a keg party (though sometimes we sneak a flask of bourbon). It wasn’t until a game early this season, in which I broke down Bryce Harper’s hitting mechanics with words, gestures, and diagrams, pondering this important matter with my companion (also a baseball writer), that I realized how different we were from other attendees. With such company comes the responsibility of keeping score the right way when entrusted with someone else’s book; not only is it the polite thing to do, it is a showcase for your own baseball knowledge. One would hate to mind a friend’s, stranger’s, or in some cases, a lover’s book and denote something incorrectly in pen (always pen). That permanent record of ignorance, an “E-10”, error on the score-keeper, is embarrassing and destroys credibility. As the old-timer departed for the gentlemen’s rest, I l scoffed inwardly: “Of course I can keep score for you old man. I have a knack for this.” It had always been the truth…until that seventh inning at Wrigley Field, when I looked down at his scorecard and was completely befuddled by a mess of scribbles, scratches, and abbreviations I’d never seen before. Not only did it seem like we’d been keeping scores at different games, I wondered if he’d handed me a scorecard from a cricket match or the launch code for a nuclear missile he’d acquired in the Cold War, because none of it made sense.War, because none of it made sense. I put our scorecards side by side looking for similarities, but observed mostly differences. We had how we documented walks and strikeouts in common, but little else matched. 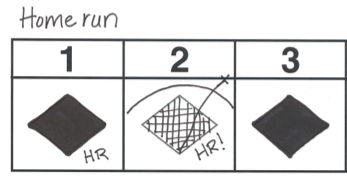 Where I used a line to show a base runner, he used dots. I used “1B” to acknowledge a single. He used a dash. In the third inning I marked a fly ball to centerfield as “F8,” a small number one in the lower left corner to denote which out of the inning it had been. In his box was a giant number 8, with nothing else.similarities, but observed mostly differences. We had how we documented walks and strikeouts in common, but little else matched. Where I used a line to show a base runner, he used dots. I used “1B” to acknowledge a single. He used a dash. In the third inning I marked a fly ball to centerfield as “F8,” a small number one in the lower left corner to denote which out of the inning it had been. In his box was a giant number 8, with nothing else. If the seventh had been limited to a 1-2-3 inning with strikeouts and fly outs, I would have been able to mimic his style easily enough to fake competency, but of course it was an inning of complex and unusual events that I found impossible to capture in his style. There was a pitching change. On my card I knew exactly where to put it, but on his card I left it blank. I wasn’t sure how he would score Starlin Castro fielding the ball, stepping on second base, and throwing to first for a double play; I considered 6-6-3, 6-3, and 6u-3 as possibilities.easily enough to fake competency, but of course it was an inning of complex and unusual events that I found impossible to capture in his style. There was a pitching change. On my card I knew exactly where to put it, but on his card I left it blank. I wasn’t sure how he would score Starlin Castro fielding the ball, stepping on second base, and throwing to first for a double play; I considered 6-6-3, 6-3, and 6u-3 as possibilities. When he returned, I handed him his scorecard, relieved for the exercise to be over. Apparently puzzled, he took the seat next to me, removing the pen from behind his ear with a twirl. I talked him through the events of the inning. 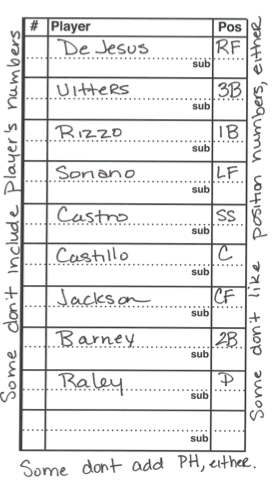 He muttered something, wrote the name on the blank, but did not indicate which inning the pinch hitter had entered. He thought for a moment, then scribbled 6-3 across the center of the box, confirming my suspicion that we’d score that occurrence differently. When he was all caught up, he shook my hand and thanked for me for minding his book, then returned to his seat on the aisle. It felt like a rebuke.center of the box, confirming my suspicion that we’d score that occurrence differently. When he was all caught up, he shook my hand and thanked for me for minding his book, then returned to his seat on the aisle. It felt like a rebuke. After his departure, my mind dwelt on the nuances of scorekeeping. I’d encountered subtle differences in scoring before, but nothing like this. Sure, at times determining what actually occurred on a play (a hit versus a error, for instance) can be subjective, but I had never considered that clearly defined events allowed so much room for variation. I had incorrectly assumed that we all maintained our meticulously detailed artifacts in the same. Like any curious-minded individual with too much free time, I decided to conduct an experiment. 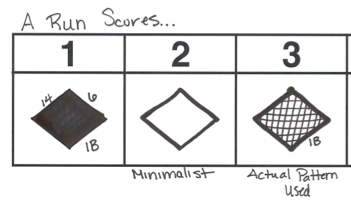 I sent a list of questions, a blank scorecard, and a link to an MLB Gameday/box score to 10 people, and asked them to score the seventh, eighth, and ninth inning of the game I’d scored for the stranger at Wrigley Field. The participants were of varying backgrounds and skillsets, but none are professional scorekeepers. Their scoring experience ranged from six months to 25 years, though the average participant had eight years of scoring under his/her belt. Once I received all of the scorecards, I printed them and pinned them up around my office, all in a column, so I could review the results. And then I laughed. A lot. Of the 10 scorecards, there was only one that closely mirrored how I keep score, and I recognized the handwriting immediately: It was the scorecard of my best friend and frequent baseball seat-mate. The rest were incredibly different. I never laughed in judgment, nor did I ask aloud, “What the hell was he thinking when he scored that?” I laughed at just how different the baseball experience and the scorekeeping was for each participant. I read the origin stories of how they learned to keep score: The more traditional cards were kept by those who were taught by former coaches, in the press box, or had careers as scorers in high school, filling in Little League scorecards for nickels. The more avant-garde cards were kept by the self-taught and the newest scorekeepers. They challenged tradition with every out, submitting creative (and in some cases very colorful) scorecards. As you can see from the examples I’ve included here, the responses were varied, but decipherable. While there is a guide that contains examples of how to keep a scorecard like an official scorer, after looking at the research, I’m not sure I’d advocate for conformity. If you want uniformity and easily identifiable information, visit Baseball Reference and Retrosheet and read the box scores. If you want the narrative, it’s tucked between the tattered corners and warped pages of a rain delay. It’s in the mustard stains from a Chicago dog in the fifth inning, and in the boxes that are crossed out because I scored in the wrong column…again. It’s in the unique way I misspell Mark Teixeira’s name because I’m dyslexic, and it’s in the squiggly numbers that I filled in on the crowded train to complete my book on the way back to the city’s center. One thing is apparent from the narratives I received in response from the participants: We all have the same mission, documenting games, but have different ways of doing it. Some keep score because their father taught them; others keep score to establish a deeper engagement with the game. Some share a book with their spouses, others use it as a tool to fight their loneliness. One person admitted they don’t even know why they keep score, it’s just what they’ve always done. In all of the reasons, there is a great joy and pride in creating and sharing their books. Personally, my biggest motivator remains the day that I will finally be able to rush home after a game and frame my scorecard and ticket stub from my first no-hitter, but so far all of my scorebooks remain intact. If they lack historically significant events, they maintain a personally significant record of my games, my travels, and time with friends. It’s likely I’ll continue to keep score. Some folks take pictures and put them in albums, but I have a shelf dedicated to books of 6-4-3s, 3us, and F9s to tell where I’ve been. I think about teaching others, my unborn children and nieces and nephews, in the same way my mother taught me. For me, keeping score at a game is about patience, passion, and engagement. The sweetest thing of all, though, is what I learned from conducting this experiment: scoring is something anyone can do and yet there is no right way to do it. It is a completely individual form of art. In short, scorekeeping is exactly like life, and if an old man’s scribbles in a corner of the world that is section 226 at Wrigley Field don’t match up with my aesthetic sensibilities, who am I to criticize? Each game we score is a way station; we make our mark and move on, cave-painters at the stadium. We have a record of our passing, and no one can judge us. A special thanks to the following, for submitting scorecards, sending narratives, or just for talking baseball: Nick Tavares, Matt Hegarty, Ryan Pavlicek, Kyle Worrell, Nicole Haase, Daniel Yaussi, Brett Myhres, Adam Brown, Ruhee Dewji, Josh Nelson, Mark Primiano, Harry Pavlidis, and Michael Bates.